As we enter the hottest months of the year, it’s important to stop and think about heatstroke. As a pet owner, understanding the consequences of heatstroke is crucial to your dog’s wellbeing. 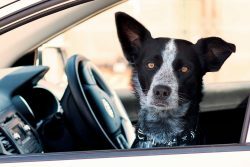 Unfortunately, people tend to think that leaving your dog in the car for a few minutes isn’t going to be a problem — only to discover that during their time away, the temperature within the vehicle has increased exponentially. Did you know that it can take Just Six Minutes for a dog to start suffering from heatstroke if left in a car? Other common issues from pet owners include forgetting to fill their dog’s water bowl before they leave for the day, or neglecting to provide an area of shade or inside access if their pet is outside. These actions are just a few of the ways that dogs can get heatstroke. But what is heatstroke, and why is it so dangerous for dogs? Heatstroke is a type of non-fever hyperthermia which is caused by increased body temperature. It’s a very serious, life-threatening condition and it can cause damage to your pet’s internal organs – sometimes to the point where they stop functioning. Unlike humans, dogs don’t have sweat glands all over their bodies. Instead, they have only a few in their feet and around their noses. This means they cannot regulate heat in the way that we can. Dogs, and many other animals, rely on panting and external cooling to lose heat. They also rely on being in a cool, well-ventilated and shaded environment with access to clean drinking water. 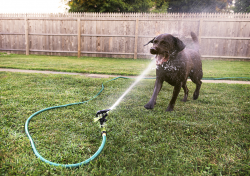 Read our full list of how to help your dog stay cool in summer here. There are also certain breeds that are more susceptible to heatstroke. Flat-faced breeds (brachycephalic anatomy) such as Pugs and English and French Bulldogs have greater difficulty regulating heat. If your dog’s body temperature reaches above 40 degrees Celsius or it is exhibiting any of the above symptoms, immediate attention/first aid is required. Early recognition of heatstroke is crucial to your pet’s safety. Remove your pet from the hot environment immediately. Apply or spray tepid/cool water onto your dog’s fur and skin and then fan to maximise heat loss. If you don’t have a spray bottle, try wrapping your dog in a towel wet with tepid/cool water. Don’t use ice-cold water as this might cause blood vessels near the surface of the body to constrict, decreasing heat dissipation. A shivering response is undesirable as it creates internal heat. 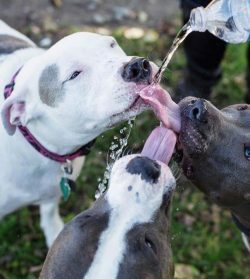 Get your dog drinking cool, not cold, water and wet the area immediately around your dog. Seek veterinary attention. On your way to the vet keep your dog cool with car air conditioning and continue to spray with tepid water. After the first three steps your dog may appear to be recovering but it’s important you still take your dog to see your vet. Heatstroke is a very serious condition and your dog may require intravenous fluids to cool the body properly, maintain blood pressure, support the kidney system and help speed up recovery. Rarely is home treatment enough to save your dog from heatstroke. Always visit your vet and get them to check your dog’s blood clotting times, kidney function, and hyperthermic condition. Whether you are a pet owner or a pet professional you owe it to yourself and your pet to be prepared for any emergency. This could be in the form of a pet first aid course. Science continues to provide us with new information, methods and techniques for caring for our pets and enrolling in pet first aid is a great way to stay on top of that information. Having the necessary skills can save your pet’s life in an emergency. Caring for your pet is also about common sense and knowing when your dog is most at risk. Pay attention on hot days and provide your dog with plenty of shade, water and good ventilation. Your pets can’t always cool themselves down, so as a responsible pet owner it’s your job to keep them cool during the hot summer months. And again, if you think your pet may be suffering from the effects of heatstroke, contact your veterinarian straight away. For handy tips on identifying and treating heatstroke that you can refer to on-the-go, download and print off our RSPCA NSW Heatstroke Information sheet. It’s great to keep in the car!